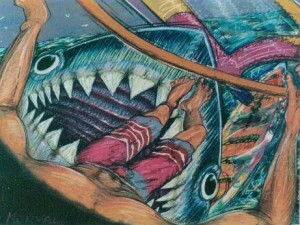 “Big Wednesday”, oil on canvas, two panels, @ 48″ x 120″, 1993. 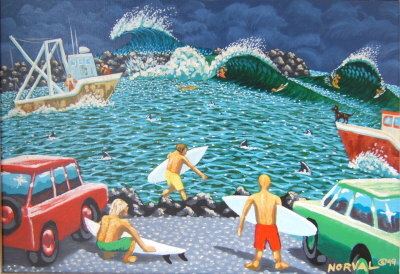 This painting shows a cyclone swell at Manly in 1993. The swell came up from dead flat at dawn to 12-15′ by lunchtime. The only surfable spots on the northern beaches were Fairy Bower, the Queenscliff bommie, North Narra, North Av and South Palmy. This was before tow-surfing was invented. Contact Grant Forbes at Tigerfish in Torquay for details.